Before we start the party, I want to thank you all for the get well wishes. I am still trying to get over it, but not having much luck. Had to go back to the ER today and I have spent most of my day there with an IV in my arm wishing all this goes away soon, but not even close to being myself. I guess as we get older these things take a little longer. I don't want to let this interfere with the weekly party and highlighting last week features. 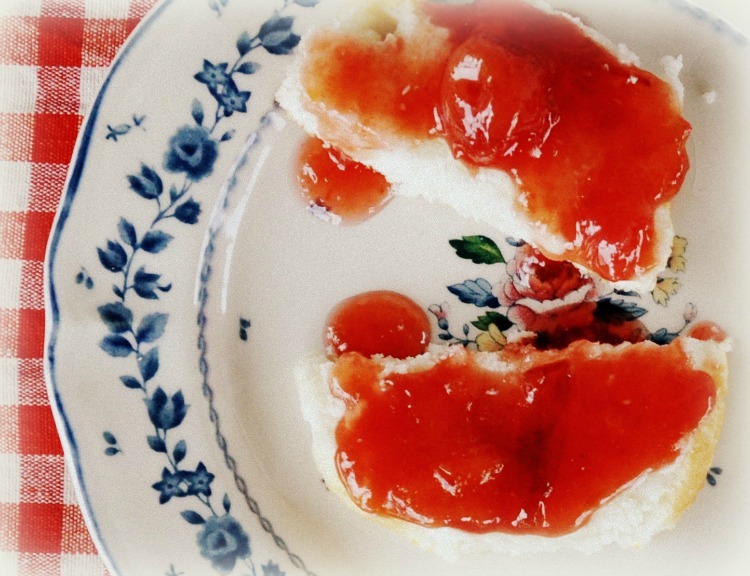 Let me share with you the most viewed links from Tuesdays at Our Home #20. The post that received the most visits was Dani's from Rock Point Manor. She and her husband did a beautiful job remodeling their kitchen. Love their backsplash! Sally from Salmagundi gave us a tour of her beautiful garden and flowers. Like most of us, she is hiding from this terrible high temperatures we are all experiencing. Great post! Southern Seasons shared with us her laundry room makeover. Love her new shelves! Beautiful space! Debbie from DEBBIE-DABBLE gave us a wonderful tour of her gorgeous cottage garden. So pretty! 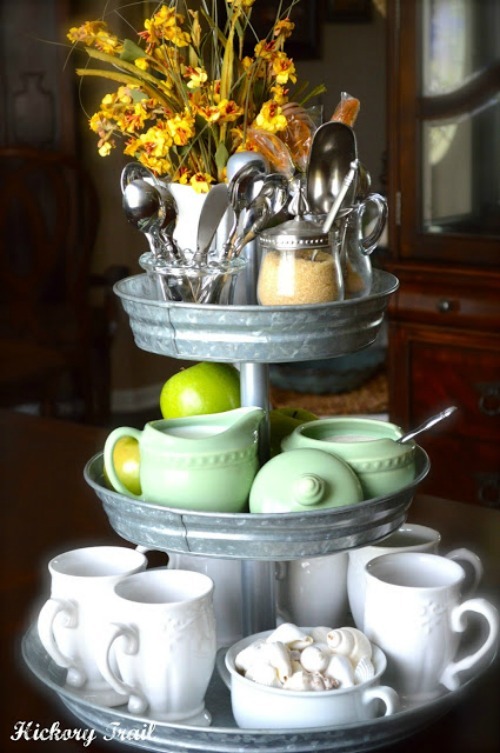 Angela from Hickory Trails shared with us her beautiful and original coffee station. Love this idea! Lisa from Createinspire did an amazing job refinishing two night stands for her bedroom. Beautiful color! Now, lets see what you all have created this week! I apologize for the lack of posting, returning emails and answering comments. Been really sick for several days. I will be back as soon as I am back on my feet. It all started when I purchased a small basket from Ross. I also had to find a new corner for our coffee station. Of course, I had to move my husband's coffee maker! Sorry, honey! And the small sign I had on that side of the counter had to be moved to the butler's pantry. The only areas that stayed untouched were the island and breakfast table. And if you weren't certain already that I have lost my mind, I have to confess that while I was doing this I was thinking of how I want to decorate my kitchen for Fall. Can you tell I am a little tired already of the triple digit temperatures? 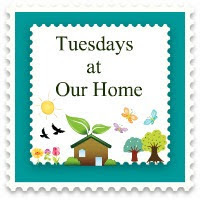 Tuesdays at Our Home is still live and going strong. Stop by for a visit and enjoy all the fabulous links. Before we start this weeks party, I want to say thank you to all my new friends and followers. I am enjoying so much getting to know all of you! And to those of you that I have known for a while now, I really appreciate all your comments, well wishes and words of encouragement.Thank you for taking the time to always visit my humble blog. I have been blogging for about a year and a half now and I have been thinking, when I reach five hundred followers, I plan to have my very first giveaway to thank you all for your continued support. With that said, I am now very pleased to highlight the most viewed posts from last weeks party. Most viewed link was Mindi's from My Love 2 Create. 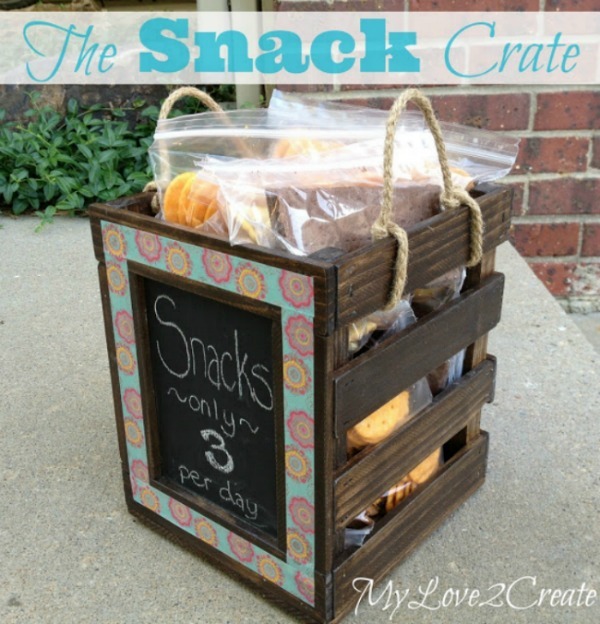 She gave us a wonderful tutorial on how she built her own snack crate. Isn't it wonderful? What an awesome idea! 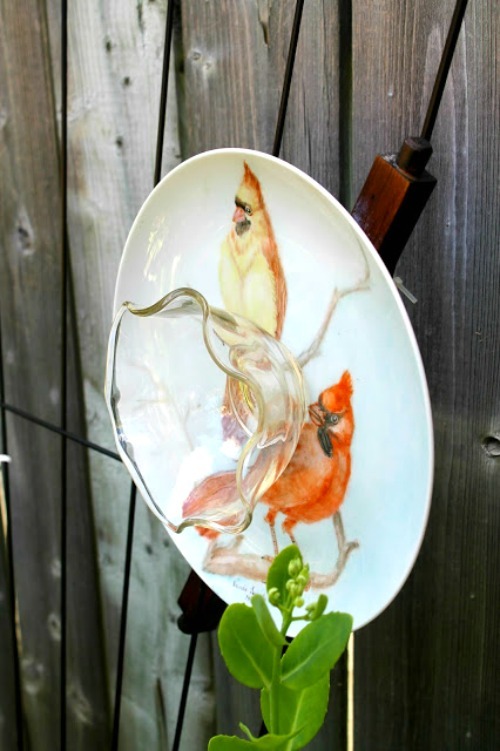 Diane, from 13 Canadian Cottage made a beautiful plate art to display in her garden! 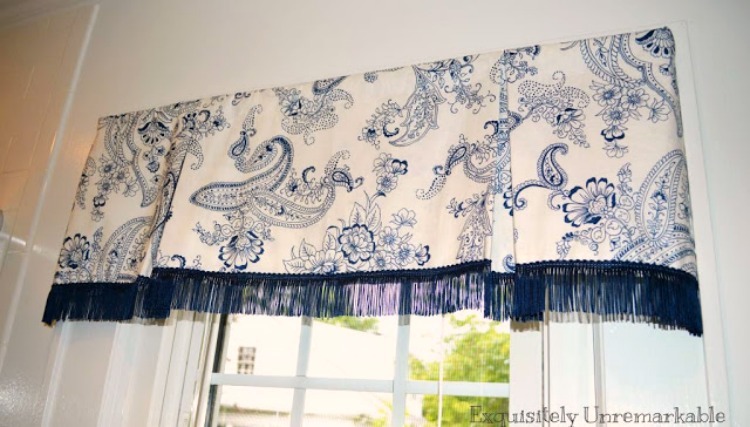 Kim, from Exquisitely Unremarkable gave a really nice tutorial on how to make your own box pleat valance. Hers turned out so pretty! Love, love this fabric! 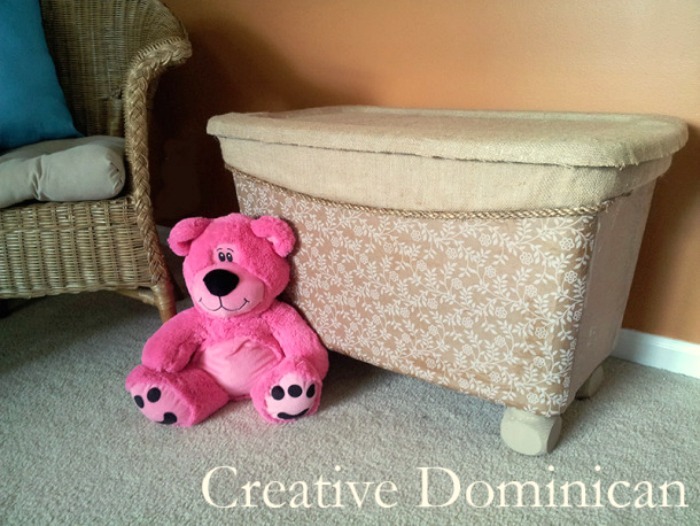 Beca, from Creative Dominican made a beautiful toy box using a simple storage bin. Rebecca from Walnut and Vine shared with us her gorgeous Summer mantle. 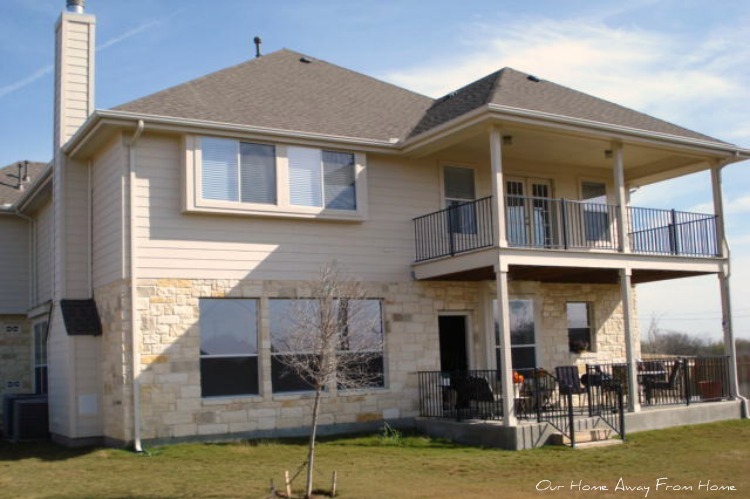 We continue working on our back porch project. 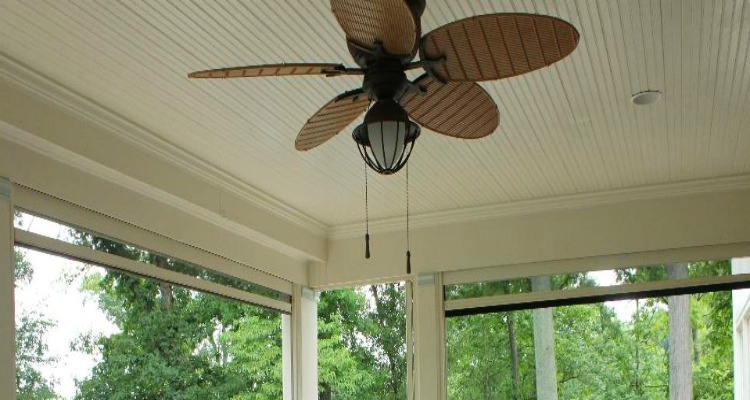 Eventually, it will be a screened in porch, although we have a nice outdoor area in the plans also. 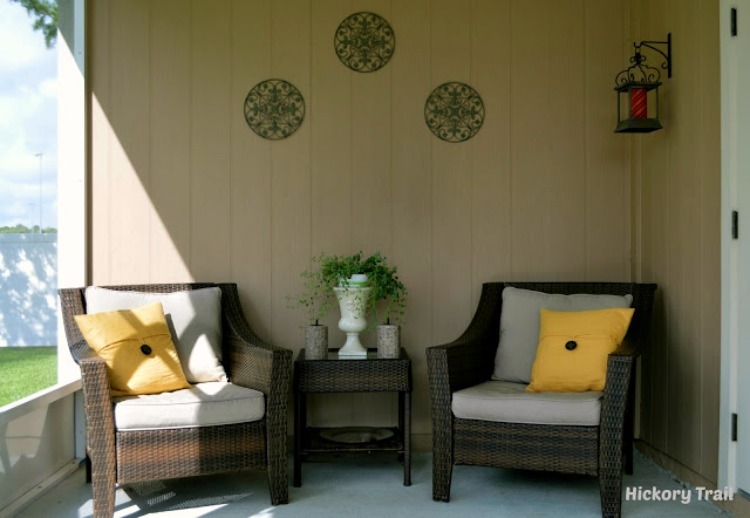 The screen in porch will allow us to enjoy some outdoor time year around without having to worry about fighting the scorpions, spiders and bees, lots, lots of bees the last couple of years!. It has gotten to the point that sitting outside is almost impossible. This is a view of the back of our home. It is an old picture, as you can see, I didn't even had made my outdoor curtains, but you get the idea. Soon, we will be adding new flooring and other upgrades, but to be able to screen in the bottom porch, we had to come up with a solution to enclose the bottom porch ceiling so when it rains, the water won't come in from the top porch, but, at the same time, the water has to be able to drain somehow. So my very clever husband came up with a little invention of his own. Not only the water won't leak through, but he is adding a draining system that will redirect any rain water straight into the gutter on the side of the house. And when is all said and done, it will look something like this. And in the process of finishing this project, we had a little visitor that decided to make home on our porch. We even had babies falling off the nest that we had to rescue because they couldn't fly yet. Enjoy the rest of your day and I will see you all here tomorrow for Tuesdays at Our Home #20 and Features. WOW! I can't believe I have been hosting this party for almost five months now! Time goes by so fast! Today, I want to share with you a small tip that really works. You all know how much I like to change my front porch decor and make new pillows all the time. So I find myself buying regular fabric and yes, living in Texas, when you leave regular fabric sitting outside for a couple of weeks in the blistering sun, this is what happens. 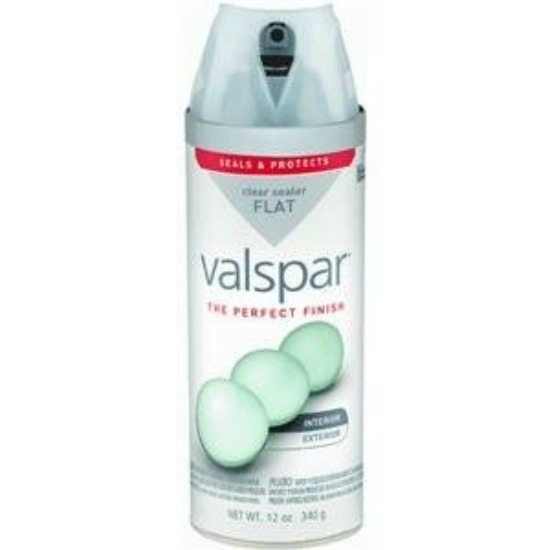 I had to figure something out and then, I remembered something I read somewhere a loooong time ago about spraying clear sealer on your fabric to protect them outdoors. So, I did just that with the most recent pillows I made for my front porch. This color is so rich and it is so very hot in San Antonio right now, I was worried they were going to be white in just days. By the way, the fabric looks and feels the same after spraying it with the sealer. I am happy to say the pillows have been outside for over a month now and they look as bright and colorful as the day I made them. I watched the water drops slide right off the pillows sitting on my front porch, just like outdoor fabric would do. 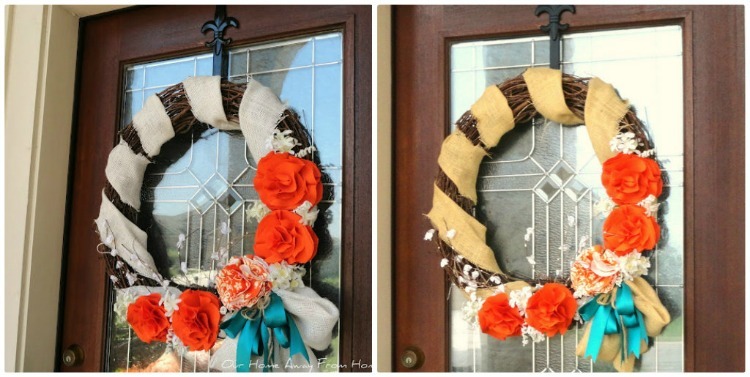 So, there you have it, a little inexpensive way of protecting your pillows, wreaths or any other fabrics you may want to use outdoors. This weeks party, Tuesdays at Our Home, is still live. I will be back with the features of the most viewed links. Some amazing entries this week! This past week we had another fabulous party! I enjoy so much visiting all your blogs and seeing all your gorgeous projects and beautiful transformations. You are all amazing! So Creative! Thank you so much for always sharing here! Before we start this weeks party, I would like to highlight the most viewed links from last week. 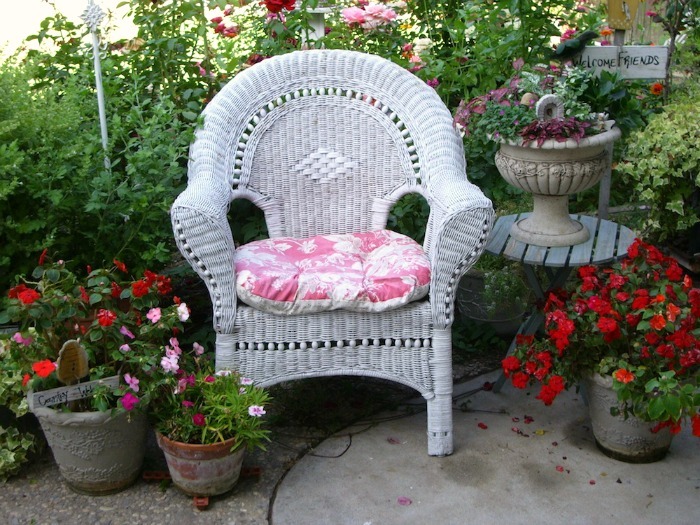 Curby's Closet shared with us a tutorial on how to make a quiet spot in your garden. I would love to sit there and just enjoy reading a book. So pretty! 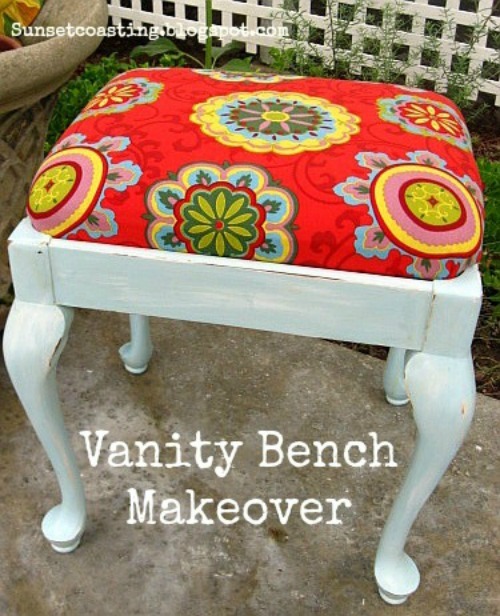 Sunset Coast shared her vanity bench makeover. Hickory Trail gave us a tour of her gorgeous patio. 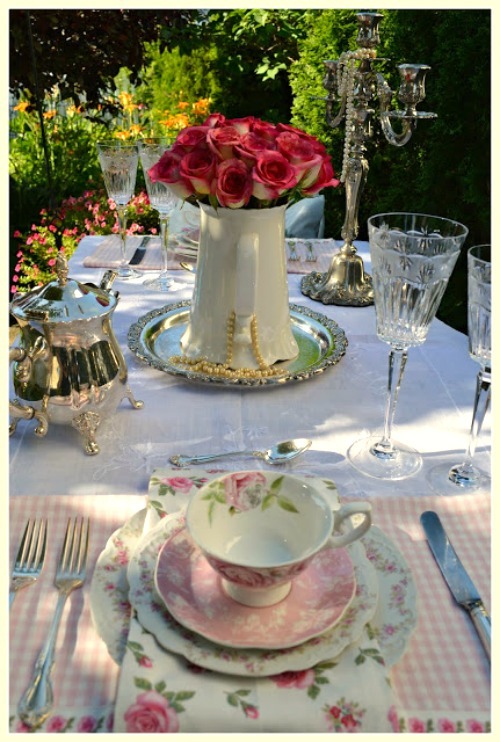 Rosemary and Thyme put together an amazing outdoor tablescape. Gorgeous! Wilker Do's shared with us a great tutorial on how she made her own AC unit for her garage! This is an awesome idea! So creative! 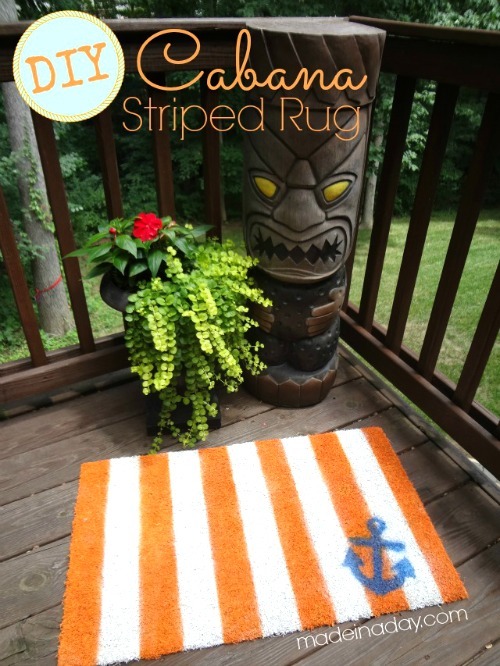 Made in a Day gave us a wonderful tutorial on how she made her own Nautical rug. So pretty! Now, are you ready for this week's party? RULES ARE VERY SIMPLE THIS WEEK!